When you know how you can organise your presentations, you can directly affect how you give them. That’s because, for you, a well-organised presentation will be easier to deliver. And for your audience, a well-organised presentation is easier to follow, easier to listen to and easier to understand. Perfect. Mind maps. Pictures that are uniquely linked together to tell a graphic story are most people’s idea of a mind map. And that’s essentially right. Pictures carry more ideas, meaning and nuance than words when you are under stress during a presentation. So, with a picture-based mind map you can organise your presentation structure with a linked network of pictures and idea flows. That’s because you can show a logical flow of ideas. This means that you can illustrate causes and effects. Or, perhaps, you can depict stories and vignettes that relate to your main points. Prompt cards. You can support all your main public speaking points with a set of small cards (postcard sized). These give some flow to your presentation with their sequential order. First, you can write points in large type. Perhaps use one point for each card. Their order is important. So you don’t have a disaster should you drop them, then it’s a good idea to tie them together. Was that the idea for this Sarah Palin tea party speech, perhaps? Slides and overheads. Undoubtedly the organising technique of choice for the harried executive. But ensure your reliance on the PowerPoint slide deck is only an organising dependency. Use the screen view with prompts at each step of your PowerPoint presentation. But take care of the basics. Don’t be tempted to use too many slides. And don’t be persuaded into reading out your slides – either from the main or the view screen. Should you fall into the trap, then ‘Death by PowerPoint‘ is a fitting description of the experience. Outlines. Prepare a one or two page outline of your presentation. Note that it should include each of your main points. You should also include your sub-points, cue points, places for audience interaction, stories and anecdotes. So, aim to prepare a readily accessible and easily read presentation outline. Then it’s a serious choice for your presentation. Script. Don’t forget the written speech or presentation, with large words. Many serious presenters use scripts with great skill. First, type your entire presentation word by word. Then start each sentence on a new line. After that, choose a typeface and font that makes it easy for you to read at a lectern. When it comes to giving a good presentation it’s important that you put plenty of attention to how you organise your presentation. 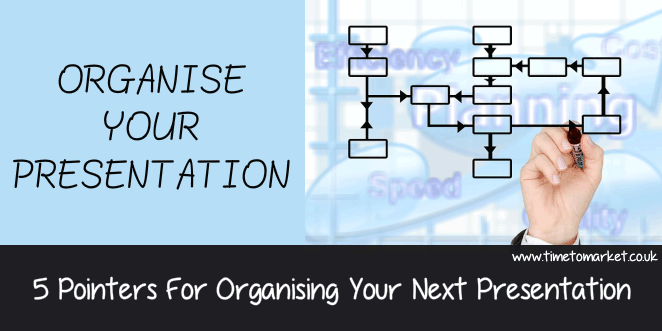 Create a mind map of visual images to organise yourself. Build a series of prompt cards with simple headings on each. Fashion a deck of PowerPoint slides with notes to help you rehearse. Write up a presentation outline to show your navigation from point to point. Prepare a script using large words. When you organise your presentation you present more efficiently. Your delivery will be better. Your pacing and timing will be well-tuned. And, best of all, your audience will appreciate your investment with a better response to your spoken words. It’s worth the effort to invest in these presentation skills. When you want to know more about how you can organise your presentations, you can always attend a presentation training course at one of our 40 training centres. As an alternative, perhaps, you might want to organise a one-to-one coaching session to get you ready for a serious conference presentation. Whatever your circumstances, please don’t hesitate to get in touch.